Brilliance for Spas Bromine System is user friendly, while also being comfortable and safe to be in! There is very low chlorine usage, and it uses Bromine to sanitize the water. This system kit will give you all the necessary items to get started on the Bromine Floating System! 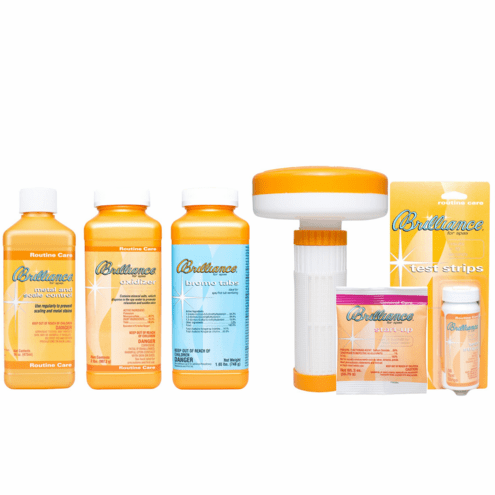 Add Brilliance for Spas Metal & Scale Control with Soy Protein. Circulate on High Speed for 30 minutes with air injectors off. Fill floater with Bromo Tabs and adjust the flow of water on the floater according to the manufacturer recommendations and place in hot tub. Circulate the water on high speed for 15 minutes with the air injectors off.